I cooked again! Yay me! I bought a cute little bag of quick-cooking farro at Central Market, and decided to try it out tonight as a salad. I started with a recipe from Plenty by Yotam Ottolenghi, but ended up changing it a lot to fit the ingredients we had. It was seriously good, especially atop field greens, which added a fresh and bitter bite. In other news, I moved the furniture around today. I’m still getting used to it, but I think I kinda love it. Otherwise, all is well. I watched Amelie again, and was reinspired with home beauty (hence the moving of the furniture). I’m thinking of getting some vintage light switches and switchplates, and thrifting for lots of goodies soon. Also, I just learned that there’s a flea market in Austin! Woot! For the dressing, combine all ingredients in a jar and shake well. Cook farro according to package directions. (I used quick-cooking farro from Central Market, which cooks in 10 minutes; I also salted the cooking water.) Drain if needed. Meanwhile, heat oil in a large skillet over medium-high heat. Add bell pepper and zucchini, and sauté for 8 – 10 minutes, until tender. Add garlic and shallots at the end, and cook a minute or so more. Season with salt to taste. 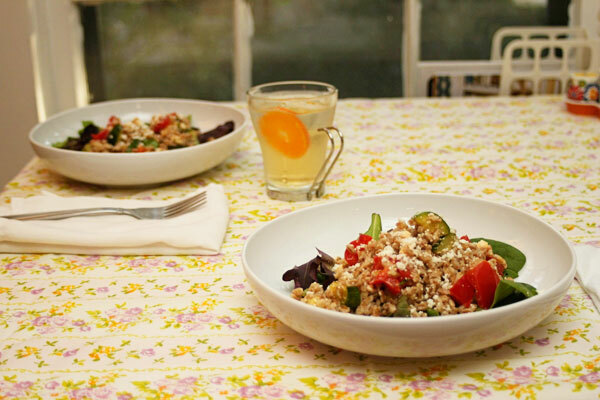 In a large bowl, mix together the farro, vegetables, oregano and cheese. Drizzle with most of the dressing and mix well. Taste, and add more dressing if needed. Serve slightly warm atop mixed salad greens and sprinkle with more crumbled cheese. Adapted (a lot) from Plenty by Yotam Ottolenghi. 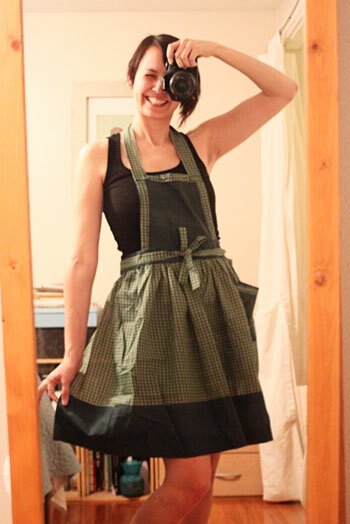 That apron is adorable! And WHERE did you get those bowls? I love their shape!